One of my favorite authors has become a friend. 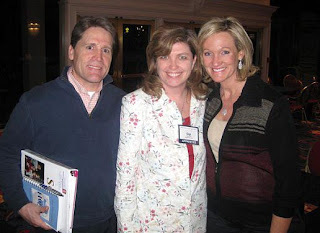 Karen Kingsbury spoke at our church’s women’s quarterly breakfast six years ago. She related the story of how her writing career blossomed and how God moved in her life to make it happen. I immediately connected with Karen as a wife, a daughter, a sister and a writer. Most of all I related to her as a fellow daughter of the Most High God! At that time I only had a dream of ever being published. Karen gave me hope that day. I bought a couple books at the breakfast and immediately became a fan. In these six years I’ve also read every book Karen has written – some of them twice! I’ve fallen in love with the characters in her books — the Baxter family — through the Redemption, First Born, Sunrise, and Above the Line series of books. Now I can’t wait for the Bailey Flanigan series. Over the years Karen has blessed me and my family in many ways. She’s always encouraging me about my writing. Now, seven years later I can say that God answered my prayer for publishing a book. My Caregivers’ Devotions to Go book was the first in what will hopefully be many books. The most recent Karen Kingsbury book I read is titled Unlocked. Karen does an amazing job covering the life of Holden Harris, a young teenager with Autism. She also touches on the subject that is hitting the media often these days — bullying. I found myself crying several times while reading this book because I understand the world of living with a disability through my son Gabe. Although Gabe was fortunate to not be constantly bullied, I do understand that bullying happens every day in schools and has been an issue for a long time. If you’re looking for something to put on your Christmas wish list, I hope it will be this book. I know you too will fall in love with Karen’s writing and the way she handles real life issues with truth and grace. So let me introduce you to Karen through her latest book: Unlocked. Can I challenge you to purchase an extra copy for the school library of a junior high or high school near you? Amazon has the book on sale right now for just that purpose! Just click on the link and order a few copies. I’d love to hear what you think about the book. Come back and comment on my blog. Your comment will earn you a chance to win a copy of one of Karen’s other books. God Bless your heart, my blog readers. Happy reading!